For this purpose, first, a number of neighboring shot gathers are saved in the memory. Then, between two given horizons, every trace is divided into a number of overlapping windows. Every window is then tapered and transformed into the frequency domain, where its amplitude spectrum will be calculated. The frequency range is also divided into overlapping bands. For each band, the average amplitude of its frequency samples will be calculated and saved. For every frequency band of every time window of every trace, its average amplitude will be compared against the reference amplitude of local traces, which belong to adjacent shots, receivers, CDP’s and channels simultaneously. This reference amplitude can be either median, or a representation of the relatively weaker elements. If the amplitude of a time-frequency element exceeds a given threshold, that complex element will be scaled down to the desired level. This scalar can be raised to a time and frequency variant power, while the threshold value can also be time and frequency variant. In order to avoid a sharp change at the band limits, a gradually degreasing scalar will be applied when the ratio is under threshold. Finally, the trimmed windows will be tapered again before merging back into a denoised trace. 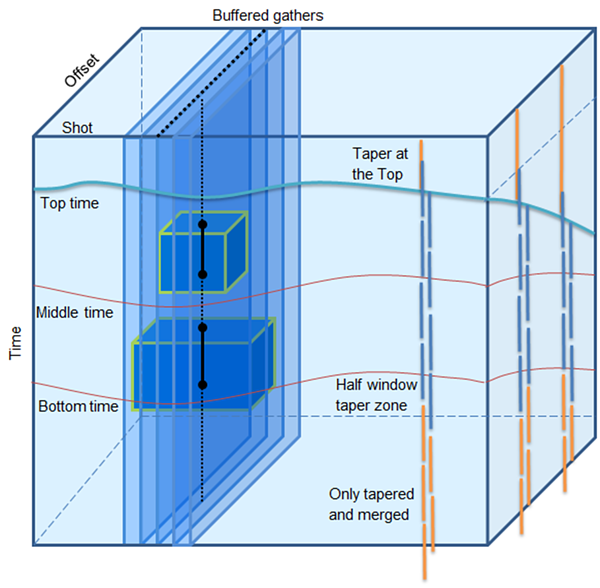 A schematic diagram demonstrating how the denoising process is performed in a multidomain cuboid.